In the past two years, the Petaluma Arts Center has delivered several well-curated and immensely popular shows. “Family Tree,” the center’s latest exhibition which runs through March 13, may be its best yet. The show explores the lineage of fine woodworking in California from 1945 onward and is one of its most ambitious shows to date, bringing a number of woodworking masterpieces into the small center along with a bevy of artist demonstrations and talks. If your conception of woodworking runs to bowls, tables and chairs, the show offers plenty of fine examples of these but it will also update you with some of wood’s latest trends. 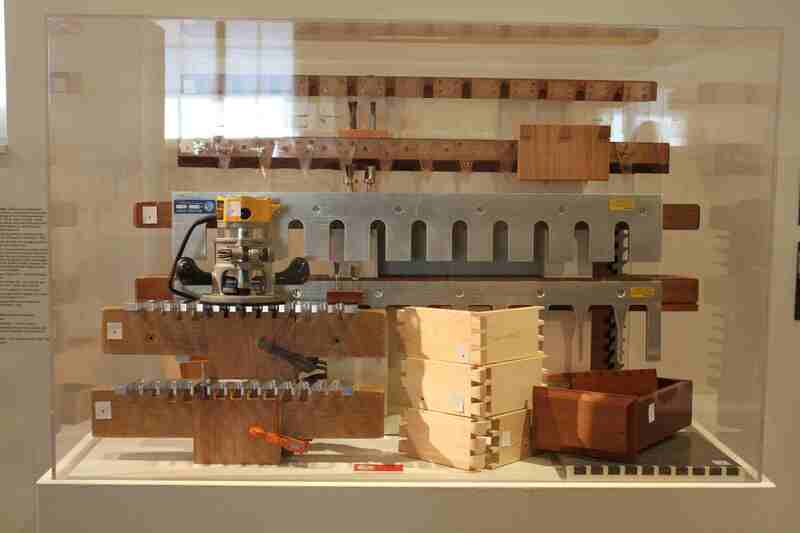 It also makes a compelling case for elevating fine woodworking into museums as a vibrant form of conceptual craft. “Family Tree” is curated by Kathleen Hanna and presents the works of 25 artists, ranging from pioneers and mid-career artists to new entrants whose work has been influential in the CA contemporary fine woodworking movement. Along side of this show, in the center’s community gallery, stands the innovative work of several students from the Furniture Program at California College of the Arts who are rising stars in fine woodworking. Much in line with modernist principals of clean lines, truth to materials and simplicity, early woodworkers revered the wood itself for its own inherent beauty and didn’t paint it or cover up its beautiful grain. Art Espenet Carpenter’s (1920-2006) “Double Music Stand” is just one of the masterpieces on display from pioneering California wood artists. Art Espenet Carpenter's iconic "Double Music Stand," in rosewood, is one the masterpieces of wood art on display in "Family Tree." Legendary for his sleek and distinctive furniture, Carpenter, who had just returned from military service was so inspired by a Good Design exhibition in 1946 at MOMA in New York that he bought a lathe and took up woodworking. He then moved to California, where later he exuberantly embraced furniture design. He taught at San Francisco State and became so popular that over 130 woodworkers apprenticed under him in his Bolinas studio. 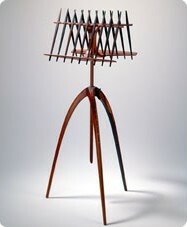 His double music stand, fashioned from rosewood, is finely inlaid with metal and exhibits elegant refined curves that show influence of Alexander Calder, Charles and Ray Eames, and Robert Maillart , a Swiss engineer and bridge builder whose startling and original spans influenced 20th century artists of all kinds. The form of this music stand so appealed to Carpenter that he worked with it throughout his life, modifying it and creating many examples. Carpenter was also a founding member of the influential Baulines Craft Guild, formed in the early 1970’s, which brought skilled artisans together to further their techniques and artistic dialogue. This led to the formation of Dovetail Gallery on Fillmore Street in San Francisco providing a market for their works. 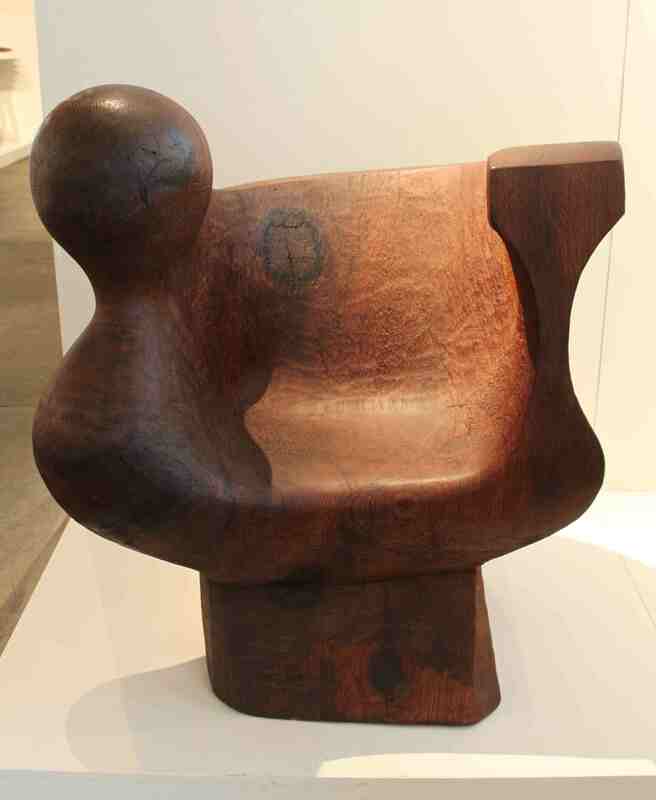 Sculptor J.B. Blunk (1926-2002) , whose proud and massive carved redwood chair(1978) is also on display, had a strong influence on wood artists in the 1960’s and 1970’s. Using a chainsaw, Blunk created such iconic works as “The Planet” (1969) which graces the entrance of Oakland Museum of California’s Natural Science Gallery (closed for construction until 2012) and is made entirely of one ring of redwood burl thirteen feet in diameter. Like many early woodworkers, Blunk took up woodworking after military service. After serving in the army in Korea, Blunk was discharged to Japan where he met sculptor Isamu Noguchi and delved into Japan’s rich ceramic tradition, apprenticing with legendary potters Kitaoji Rosanjin (1883–1959) and Bizen style master Toyo Keneshige (1896–1967). After returning to the U.S., Blunk built his own home and studio near in Inverness and remained true to an aesthetic process that sought to release the inherent beauty in the material he worked with. His legacy continues posthumously with a residency program through his Inverness studio. Bob Stocksdale’s lathe-turned vessels fashioned from exotic timbers, like this 1979 bowl from Ebony, exquisitely showcase each piece of wood’s unique grain and beauty..
aesthetic object. Stocksdale’s small thin lathe-turned macadamia nut bowl, barely 3 inches in diameter, is a perfect harmony of graceful form and material, as is his larger Magnolia tree bowl. These bowls were once available in limited supply at Gump’s and reasonably affordable as beautiful utilitarian objects. Now, they are highly collectible and fetch thousands. Stocksdale’s love for exotic timbers, his care in selecting just the right piece of wood, and his gifted use of simple tools to explore the inherent beauty of wood grain were trademarks that gained him celebrity status. Like most artists, he did not arrive at this spontaneously. 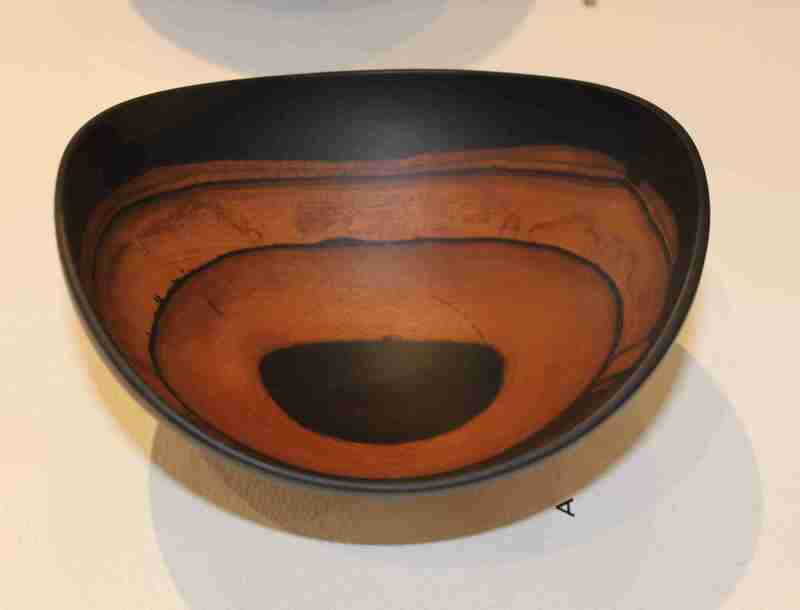 He was influenced heavily by James Prestini (1908-1993), an engineer turned artist who started to lathe turn wooden bowls in the 1930’s as art objects—bowls so thin they appeared to have qualities similar to glass or ceramics. Prestini’s new way of looking at woodturning, with his emphasis on the design and shape of the object, influenced an entire generation, especially young Stocksdale, who first encountered him in Berkeley. Berkeley artist Merryll Saylan was one of the early female entrants to wood art and is noted for her polychrome finishes. “Tower, Keep and Besamim Büchse” (2005) are three turned towers she created referencing her husband’s experience on life support. Looking back at the sexual politics of the mid-century and the immediate post WWII environment, where woodworking and handicrafts were forms of rehabilitation, and the explosion of power tools that became readily available and affordable, it’s easy to see why woodworking was initially a man’s activity. 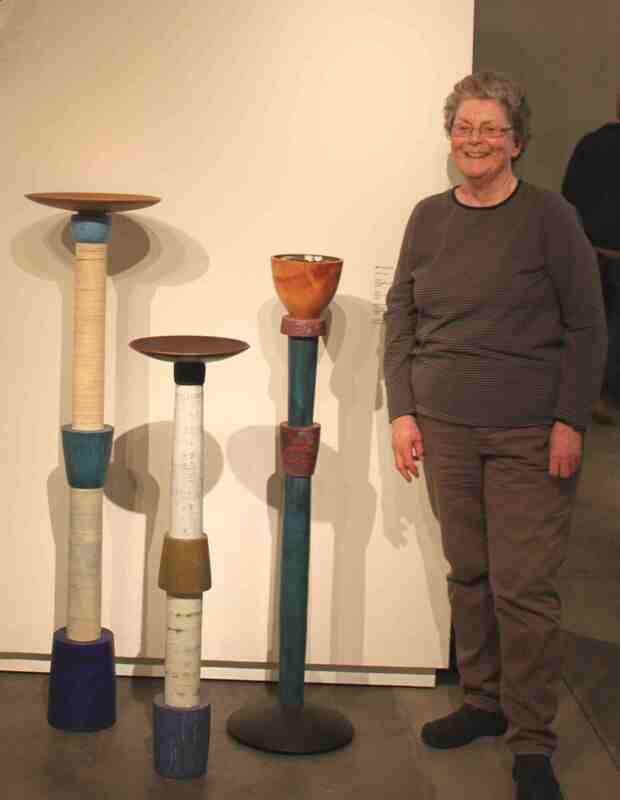 Berkeley artist Merryll Saylan, was one of the early women in the field, emerging as a leader in the use of color and texture in her lathe turned work. 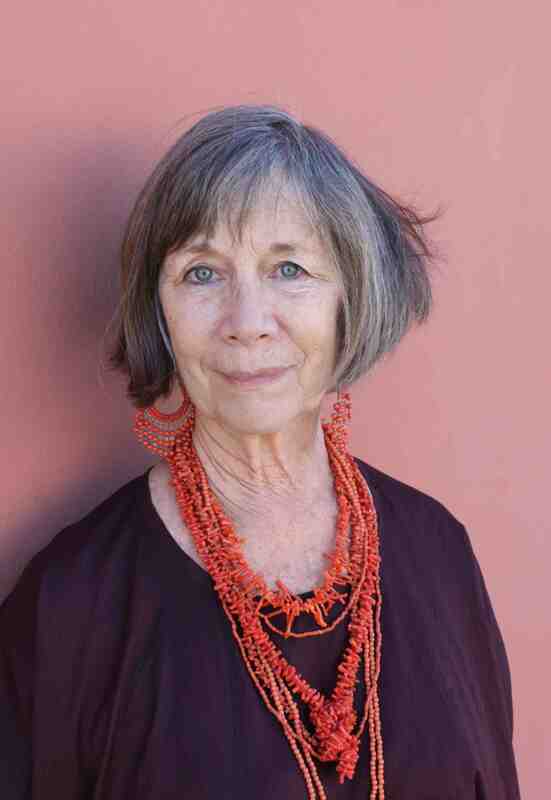 She is part of the second generation of California artists who really went beyond worshipping wood for its inherent qualities and began to experiment with color, finishes and sculptural embellishment. This generation of artists introduced a new round of individual expression to woodworking and began to elevate wood to the realm of conceptual craft. “Tower, Keep, and Besamim and Büchse”(2005) are three turned wooden towers forming a powerful installation that incorporates the actual nitroglycerin bottles used by Saylan’s husband when he was on life support. Aside from its highly personal nature, Besamim and Büchse (Jewish spice box) are a conceptual reinterpretation of Jewish ritual. The towers have an opaque hard finish that Saylan has created with polychrome “milk paint” which she makes by adding colorants to caseine (processed from the curd of soured milk). Milk paint is water soluble when wet but it becomes virtually intractable when dry and forms a very stable and attractive protective finish—an apt metaphor for what it must have taken to gain recognition in a predominantly male field. Griff Oakie, from Santa Rosa, began working with wood in the early 1970’s and initially rebelled against color and the trend for painting wood that emerged in the 1980’s. In “The Hand of the Maker,” for fun, Oakie put a very expensive bright red lacquer on a bench he’d made, completely covering the beautiful figurative aspect of the wood, and embellished it with a carved wooden hand left unpainted. Gary Knox Bennett (born 1934)v has attained legendary status in the field of furniture and is well-known for his subversive humor. In the 1960’s he created lines of roach clips along with his lucrative large-scale furniture and he also started a metal-plating company and has since imbued his wood furniture with decorative metal. 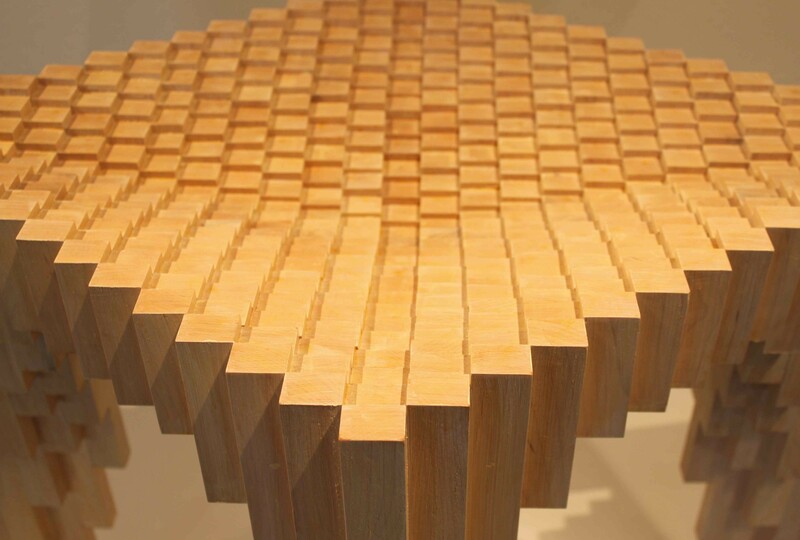 Hanna selected one of his satiny redwood tables for “Family Tree” and encourages viewers to browse through any of the 10 artist statements he prepared for the show. landings, and to be moved easily with one hand. Eriksmoen, who teaches at California College of the Arts (CCA) in San Francisco, has travelled the world studying ancient techniques which she applies in conjunction with state of the art design practices taught at CCA. The result is a thoroughly refreshing body of contemporary work imbued with life, movement, whimsy, and stunning craftsmanship. Highly creative approaches to woodworking are being nurtured in CCA’s Furniture Program and instructors Russell Baldon, Donald Fortescue and Barbara Holmes also figure prominently in “Family Tree.” Russell Baldon’s “Bad Digital” is a digitally-designed and executed table that resembles a Victor Vasarely painting in 3-D. Baldon, current chairman of CCA’s Furniture Program, intentionally designs his work so that it straddles the line between furniture and art, science and art, and between function and nonfunction. Australian born Donald Fortescue, previous chairman of CCA’s Furniture Program, was one of the first artists to receive the Experimental Design Award from SFMOMA (San Francisco Museum of Modern Art) in 2001. 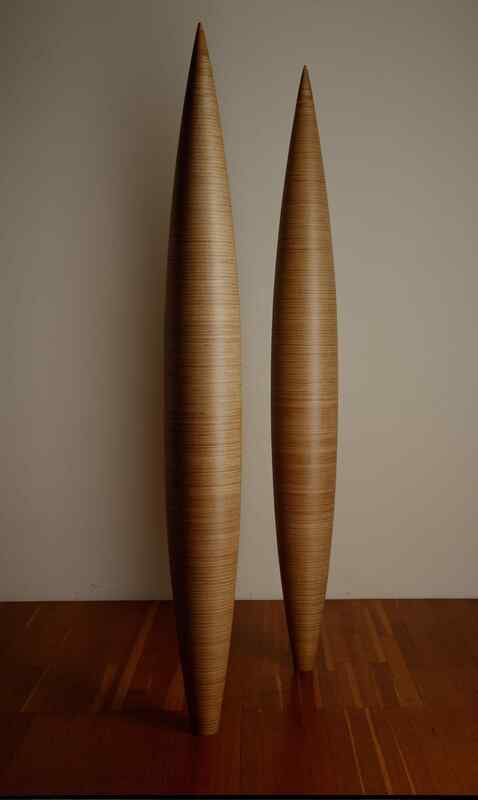 “Pike” (2000) are two impeccably made sculptural vessels that comment on the potential of non-rectilinear processes now common in design applications of all types. Each was made by gluing innumerable rings of birch plywood together, then lathe-turning and painstakingly hand-finishing it into a single smooth layered form. These layers, like sedimentary strata, stand as a perfect commentary on art’s cycle. In the long run, almost everything in America that starts out at the pinnacle as a coveted art/design object in galleries or design stores cycles downward until it reaches Target and then ascends in large consumer markets. 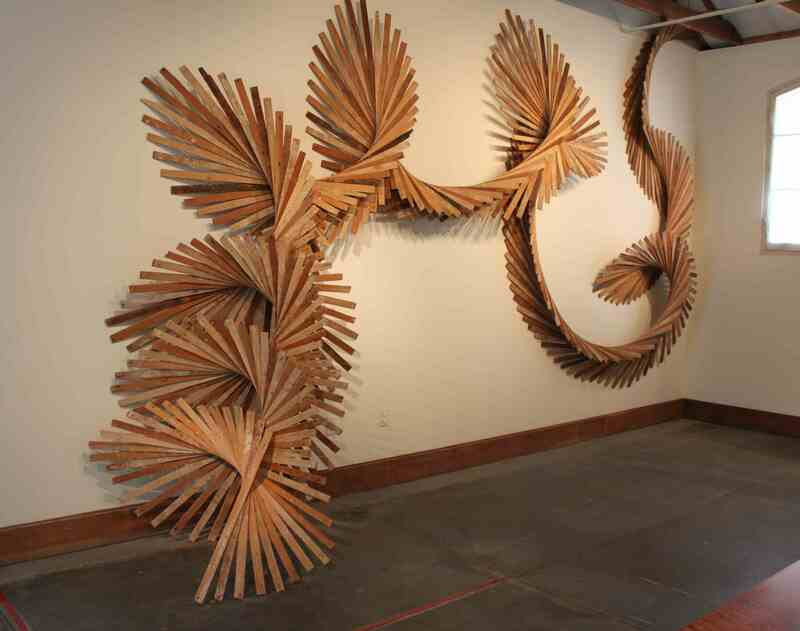 Barbara Holmes, a fine woodworker and CCA instructor from Oakland, has created the site specific “Tacoma” from reclaimed redwood lathe specifically for the Petaluma Arts Center. This lyrical, spiraling 12 foot long line of lathe unfolds like a melody across the gallery wall. The technique of stacking slats, nailing them and creating spirals is recent and springs from a residency Holmes did at the dump where she discovered how much lathe was a discarded by-product of demolition. The repurposing of wood and wood objects has become particularly popular in Northern, CA, because of our strong interest in sustainability and eco-consciousness. Wood artists like Holmes are exploring the material in new ways and creating pieces with a strong conceptual element behind them. 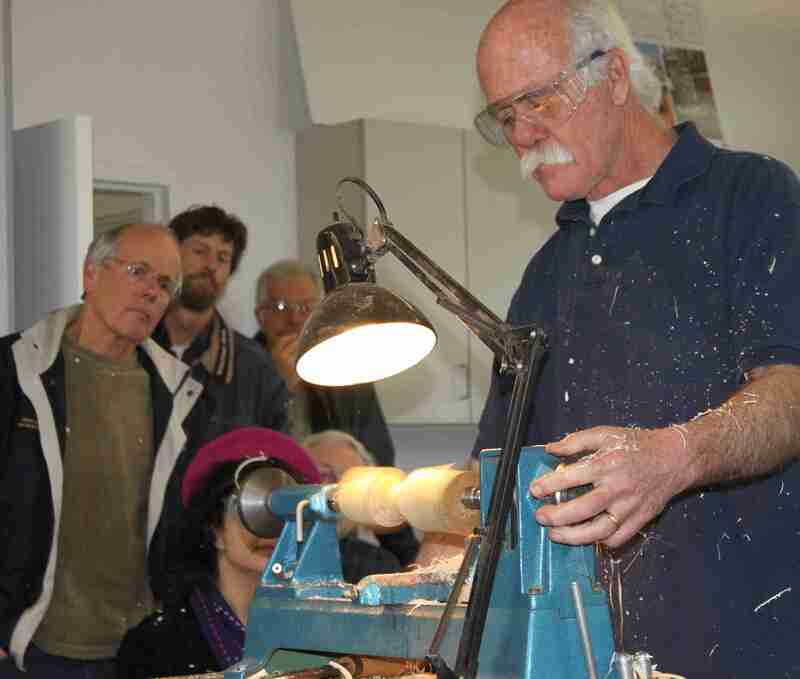 In late January, Jerry Kermode, a full time wood turner from Sebastopol, gave one of the center’s most action-packed artist demos ever on problem solving for wood turners. “I love the lathe because it’s really the only tool in the shop where you are the blade,” Kermode told a packed house of wood enthusiasts. Kermode teaches wood techniques out of his home studio and is featured in Sunset’s The Ultimate Garage: Getting Organized, Outfitting Your Garage, Creative Use of Space. 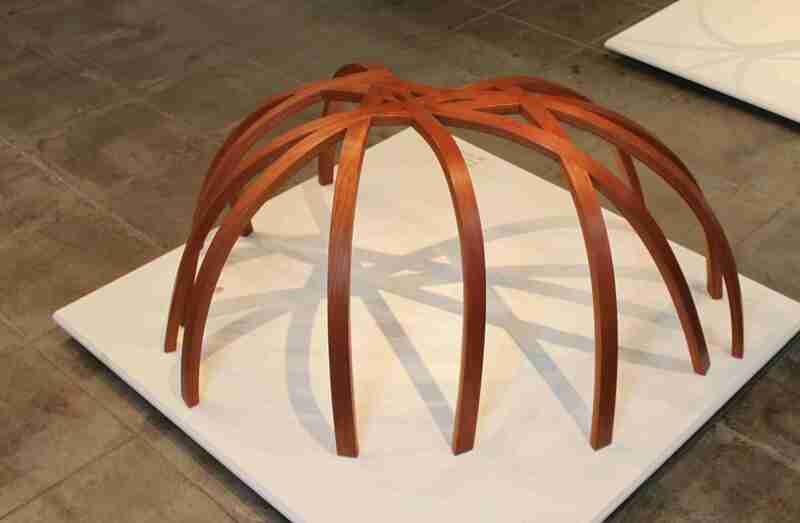 David Keller’s dovetail jigs, revered in wood circles, are on display at the Petaluma Art Center’s “Family Tree” through March 13, 2011. Keller worked for Art Carpenter in the early 1970’s who demanded that all casework be dovetailed, a task that was painstakingly done by hand. Together Art and Dave recognized a need for a jig that could precision dovetails and Dave subsequently designed it, along with the first flush-trim router bit . His model 3600 jig that he designed long ago is still a best seller and his bit has revolutionized tool work. Dave Keller, of Petaluma, who apprenticed and then worked with Art Carpenter in the early 1970’s, refined Carpenter’s technique for uniform dovetail joinery into the Keller dovetail system in 1976. Hanna has created a display of three of Keller’s aluminum templates and examples of different ways that dovetails are used. John de Marchi is a Petaluma sculptor and machinist/welder renowned for his finely-designed hand tools for woodworking. De Marchi fabricates new tools from scratch out of the finest steel available and also elegantly refurbishes old tools. The community gallery presents a snapshot of some of the latest developments in furniture design through student artists from the Wood Furniture Design Program at California College of the Arts. These rising stars were asked to respond to various design problems posed by their instructors and you’ll see cutting-edge works in a variety of style, materials and intents. 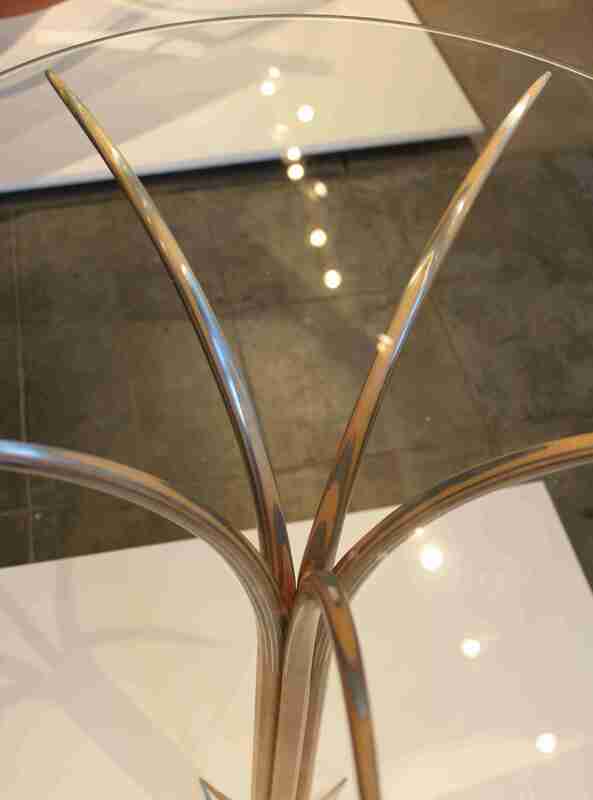 Andrew Perkins’ stunning table “Alumination” is a clever use of aluminum, a very flexible material, which has been layered with maple wood and then cut and sanded to expose elegant metal patterning whose exposure increases as the table leg tapers downward. 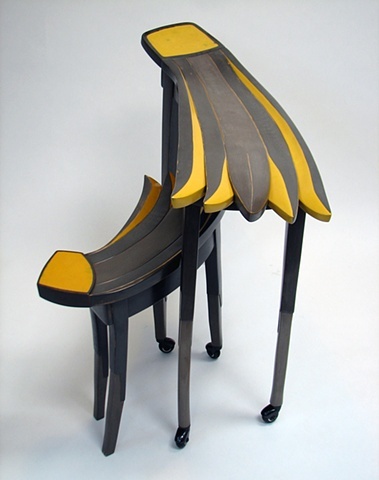 Perkins is a 2010 CCA student recipient of the Ronald and Anita Wornick Award for exceptional talent in furniture design. Noah Brezel’s “percival” (2009) is a functional seat with 12 legs that looks a lot like a spider. Brezel took cherry edgebanding and glued it and bent it over a curve to create some highly complex intersections. Brezel is interested in creating functional furniture with a perceived frailty and uses traditional hand-craftsmanship along with 3D computer modeling and laser cutting. 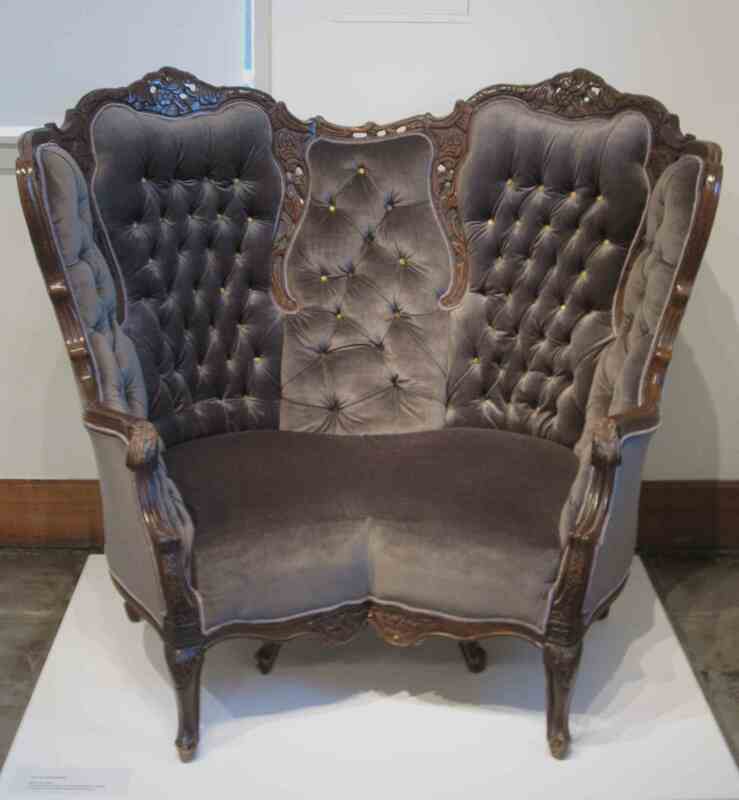 Michele Marti deconstructs Victorian furniture and then reconstructs it for her own purposes. “The Curious Sofa” has been formed by joining two Victorian chairs together to form a single sofa that forces two people sitting on the chair together to rub knees, a very un-Victorian thing to do. “Victorian’s Spread” similarly co-joins two chairs and indelicately references America’s weight gain. Marti and student colleague Brezel led a chair- making workshop at SFMOMA last year as part of its 75th anniversary celebration. Muniz has worked closely with Ron and Anita Wornick of Healdsburg and San Francisco, whose wood collection was the basis of the Oakland Museum of CA’s 1997 show “Expressions in Wood: Masterworks from the Wornick Collection.” Having amassed one of the most important conceptual craft collections in the country, and enthusiastically nurtured and supported wood artists through purchases, endowments, and fellowships, the Wornicks are now pushing to get wood its long due recognition in the country’s leading museums. “Wood will only be elevated to the level of fine art when the best of the work gets into fine arts museums and gets the exposure and recognition it deserves to stand beside other things that are more readily accepted as fine art,” said Ron Wornick. To construct complex, asymmetrical, organic forms, sometimes the best technology involves 21st century lasers, and sometimes it requires hand methods used by 9th century Vikings. An understanding of both can bring the best possible solution in Eriksmoen’s sculptural furniture work. Ashley Jameson Eriksmoen has exhibited at galleries and museums nationwide including the Fuller Museum and Pritam and Eames, and is the recipient of numerous awards and grants including the Norwegian Marshall Fund. She has taught woodworking and design courses and workshops at several schools, including College of the Redwoods and California College of Art (and Craft). Eriksmoen currently creates in her woodshop in Oakland. Fee: $5 suggested donation.